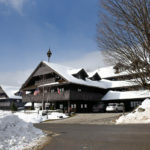 Being at the Trapp Family Lodge in Stowe makes you feel like you’re standing high in the Austrian mountains. The Sound of Music echos in the alpine air, of course. I painted the Stone Chapel here a couple of years ago and vowed to return to paint the beautiful lodge someday. Today marks the six year anniversary of “A Day in Vermont”. That was 338 paintings ago. It’s been quite an adventure. Through art and with your help, I’ve learned a lot about beauty, nature, and life. “Vermont” remains my subject of choice. The more I look, the more I see. In every corner magic is waiting to be discovered and explored. Every season, day, hour and moment offers an artist a new opportunity. Of course some days are better than others, but all have potential. On my best days, I’ve experienced artistic insight, epiphany, and joy, or stolen a fleeting glance at some profound personal truth. In my cookbook of art, those are the secret ingredients. And the best part of all? Thank you once again for your tremendous support. It continues to be my privilege and pleasure. I couldn’t do it without you! beautiful!! keep painting – always look forward to the ‘next one’!! Happy Anniversary! Sure do appreciate your efforts and they are always a bright spot to Mondays! happy anniversary…..this year I’ll be spending my 70th year coming to Lake St. Catherine…. Thanks Russ, maybe you can visit my studio…10 minutes from the lake! Happy anniversary! Beginning this blog was the best idea you could have. In modern times artists have to go new ways to spread their works. You’re very busy, you`re free and you’ve followers. In Germany we say: “No one can exist only from air and love”. So hold on and let be pleased by your paintings every week. Karl Lagerfeld said:”What’s About Money? Money that you throw out through the window will come back through the doorway. I don’t care.” So it is. If you follow your heart you’ll be successfull. Look forward to viewing your painting each week! Beautiful and Happy Anniversary!! Happy Anniversary. Six years of doing what you love and giving joy to the rest of us through your work. Bravo and keep the brush and paints close to your heart. Thank you. 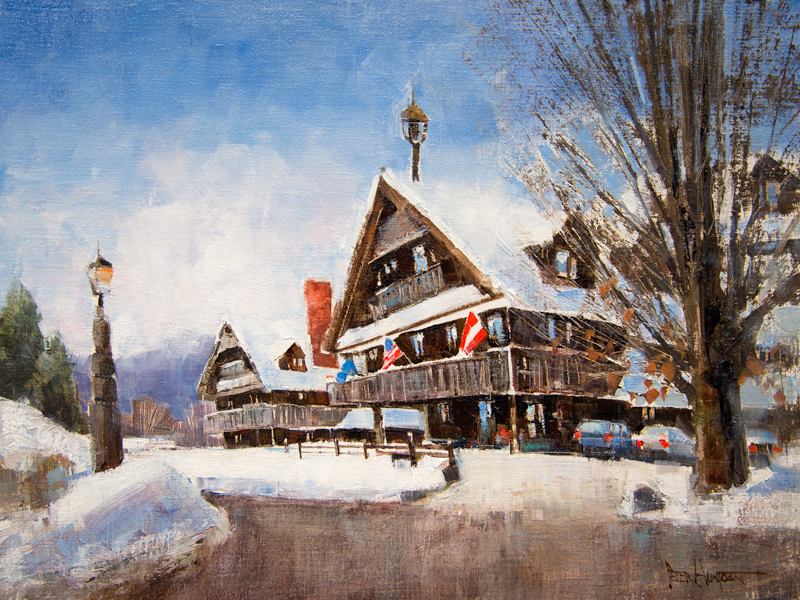 congratulations Peter , i have enjoyed your paintings and have three of them on my wall down here in Florida now.. Glad i suggested to you years ago to do the covered bridges in Pittsford . Congratulations Paul and I have owned the Inn for 5 years! Thank you Olivia and Paul, happy Anniversary to you both, and get well soon, again! I remember you coming to the Inn when I was healing from my broken hip and now I’m healing from another broken hip! I have enjoyed all your paintings, you are awesome! Well said…and beautiful image! I went up to the Peak Lodge in Killington today and painted. That was pretty darn inspiring! I am going to try and make that a habit. This is so special to me. My mother-in-law was the cook for the Von Trapp for several yrs. when they lived there at the Lodge. I was so pleased to see your beautiful painting of the Lodge and would have loved for my name to be drawn in the monthly free drawing, that did not happen but I enjoy every monthly painting as Vt. Is so special to our family. Thank you for sharing your joy! Your paintings remind me of a song from the past – “You light up my LIfe !! !” Thank you !! Six great years–wow!!! I’ve enjoyed every DAY of it and look forward to many many more. Thanks Peter. Had many good times in this place. Many lunches in the lovely building across the road. A great place to paint any time of year, Peter. Did you get to see the handsome Scottish cows while you were there? Congrats on the latest anniversary. You’re time has been well spent, and your many paintings a joy and inspiration to us all. Thanks Brian! I didn’t see the cows. Next time! Wow! Where does the time go? Happy Anniversary! You amaze me every week & I smile with every new piece. Just when I think you can’t do anything better, Monday comes. History in the making. I know, right? We gotta make the best of every day. Thanks so much Nancy! This Community is very pleasant as well as the paintings. I watched the video to the end . I was so fascinated watching the unusual way you develop a painting. Did you study painting technique or just develop your own style? Thank you Marilyn! Like I tend to answer so many questions about art, “Yes”. Meaning, all of the above and then some. After 25 years of painting, learning, study, “play”, and experimentation continue to be a top priority for me. Maybe all that time, effort, joy, success, and failure eventually adds up and refines the authentic individual voice. AKA style. I may have a different theory tomorrow!